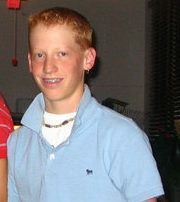 Proving redheads do know how to be cool I popped my collar AND wore a hoop earring as a freshman in high school. It’s a scary time to be a red head I tell ya. In a world where bad parts of history start to repeat themselves, I fear the worst for my band of ginger top brothers. It’s of my possibly moronic opinion that we redheads could be journeying down the wayward path of injustice. The oppression is real. Propaganda in the form of outrageously funny episodes of South Park pushes it to the next level, and in the blink of an eye national opinion promotes inequality. In our case, we are way passed unequal, we’re hardly human-we don’t even get souls. Certain business owners have even decided they don’t want to serve us. Thousands of businesses nationwide offer services carrot tops can’t use or we’ll be killed…Its true, they’re called tanning beds. All jokes aside (but not really) people call me a ginger all the time, and its never bothered me. Seriously, I’ve been called a ginger many times by many different people. Mainly the disgruntled girls I was hitting on. It just never carried with it the same sting as my inability to go outside without sunscreen. Really, when you get called somethin’ so many times it not only loses its luster, you get used to it. I’ve thought about adopting it and having one of those cool hyphenated last names. It would have made taking attendance in school so much more entertaining. Would have been worth it just to see the look on my classmates faces. In all seriousness, if you wanna call me a ginger go ahead, its over-used and unoriginal. Just beware, you are 1 minor switch of 2 letters from sayin’ somethin’ far less socially acceptable.